Can you really make over than $500k dropshipping in one year with this program by Tom Parker or is this just another lie that we are used to? Join me in this eCom Profit Sniper Review in order to find out if this is your chance to achieve freedom or is it just another hyped up program. Tom claims that after losing his role as a marketing manager, he came back and learned that his previous company has found another way of making money online what was only possible for big corporations to be successful at. And that he developed a system that would allow the normal individuals to use the same method in order to make money and get their financial freedom. And he claims that many other people that are following what he teaches inside the eCom Profit Sniper program are making up to $2,000 a day with this method. He even claims that working as little as 20 minutes a day can make you up to $500,000 in a year! I have come across many of these super-magical systems and programs that promise you to be able to easily earn thousands of dollars per day or per week putting very little effort or working only few minutes or hours a day right from day one or week one of joining them! And I know how tempting it feels to want to believe them and wanting to “give it a try, it might work this time!”. But I know that you felt that something is unrealistic with these promises and that’s what you started looking for eCom Profit Sniper reviews in order to know if Tom Parker is a legit person or a scam artist. Unfortunately, many people just go and purchase any shiny object that sells them on the dream of making lots of money quickly by working only few minutes a day, just so that they realize later that these promises were exaggerated and that it is not possible to make this amount of money with such a little effort, and they are left with disappointment. And I can tell that you can really make tons of money dropshipping with Shopify, but not if you start with the expectation to make thousands a day or even a month working as little as 20 minutes a day. I will show you below, with evidences, why I say that these guys are over-promising you and that, if you believe them, then you are going to start with the wrong mindset, which will cause a disappointment. 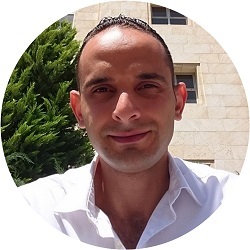 First: Another training course on the dropshipping model by one of the best in the industry. Second: A platform where you can learn a different method of making money online that doesn’t even need to do customer support, fulfilling orders or even using the PAID ads from Facebook like it is with dropshipping, which is also a 100% LEGIT method and many other internet entrepreneurs are using in order to generate money online, including myself, which is the method that I consider the best method of making money online. What Is eCom Profit Sniper System? 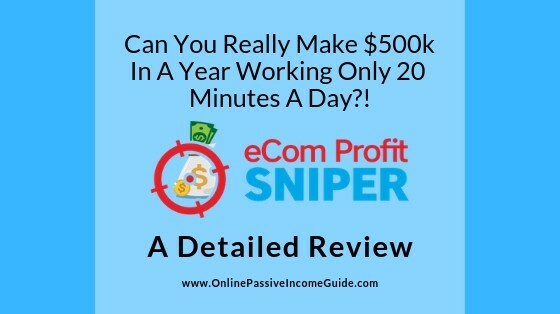 In brief: eCom Profit Sniper is a training course that is supposed to teach you how to make up to $2,000 a day working only 20 minutes per day from your home! The guy (calls himself Tom Parker) who speaks in the sales video claims that he was a marketing team member in a company, but he had to leave his job because of the difficulties his company had. And several years later, this company found a new way with which they can make lots of money online, but it was only possible for big companies to make this amount of money with it. And then, he developed his “system” that allows regular guys to make money with this same method, and now he is sharing his system with others to help them make money online. So, What Is This Method That Is Taught Inside eCom Profit Sniper? It is Dropshipping with Shopify. Dropshipping is a retail fulfillment method where the dropshipper/retailer/store owner (you), doesn’t keep the products they sell in their stock, and doesn’t even pay for them in advance. Instead, the products remain in the inventory of the original vendor (some merchant in China for example). The original merchant holds inventory of a large quantity of a certain item. The dropshipper/retailer shows the products in his online store (built with a software like Shopify) for sale, with a price higher than the one of the original manufacturer. The dropshipper drives targeted traffic to his store using different methods (usually PAID Facebook ads). One of the store’s visitors buys one of the items listed in the store and pays to the dropshipper. The dropshipper then pays to the original merchant who holds the inventory, and requests him to send the product to the customer’s address on his behalf. And this is a great method of making money online, but the problem is that the video on the sales page of eCom Profit Sniper is misleading and provides incorrect information in order to push you buy the program by selling you on the dream of making money quickly with so little effort such as working only 20 minutes a day. And there are many other misleading information that I will expose in the “What I Don’t Like About eCom Profit Sniper” section below. eCom Profit Sniper works by YOU buying the training course that will tell you how to create an online store using a dedicated platform that is called Shopify, adding some products to your store, setting up a Facebook page and an Ad Account, and then, wondering why you cannot make money as they told you in the sales video. Simply, because they don’t show you how to really make money with dropshipping, they only give you basic information that you can find for FREE on YouTube or in Shopify Academy’s courses. Lesson 3: Setting Note Slides. Lesson 4: Shopify Settings In Action. Lesson 5: Theme Notes Sides. Lesson 6: Theme Settings In Action. Lesson 1: Category Selection Slides. Lesson 1: Adding Oberlo Extension. Lesson 2: Alipay And Oberlo. Three lessons on how to create a Facebook page in order to use it for the paid ads you will need, how to setup a post for ads and how to setup the tracking pixel that will track your store’s visitors for later retargeting. These tutorials are basic and you can easily find better courses on YouTube with more in depth information. How to properly research the market and choose a niche. How to research and select products with potential to add to your store. How to research the audiences using Facebook Audience Insights tool and Google Trends. How to create effective ad campaigns to test products. How to monitor these campaigns and adsets and decide which ones to cut, optimize or/and scale. How to deal with customer support. How to open disputes with the merchants in case of unsatisfactory results due to mistakes in shipping the items. And all of the above points are important to understand in order to able to make any money with dropshipping, then how about making $2,000 a day consistently. The information in the training videos is not even worth the price because you can find it for FREE on YouTube. And in any case, you can make money with what is provided in the five modules mentioned above. These are either intended to make money from you by selling you an unnecessary course, or they are just to get you inside the door and then, blast you with the upsells offering you to buy a more advanced course, or even to recommend to you purchase others’ courses in order to make commissions from you if you buy them. Some of them are like eCom Profit Sniper, don’t provide useful information and are intended to get you inside in order to offer you to purchase more courses and programs on a later stage, and some are average to good, but they are sold at a very high price such as $997! Dropshipping is a legitimate business model, but of course they don’t really teach you how to do it successfully. Yep, the testimonials you saw in the video were recorded by paid actors whom you can hire for few bucks on fiverr.com in order to record what you want them to say. For example, the lady in the following screenshot has already appeared in many other videos giving testimonials for other low quality programs and scams. And the screen shot below is from her account on fiverr.com. Unfortunately, this is a common practice among many other crappy programs and systems that are supposed to teach you how to make lots of money, but they don’t deliver. If this system really works, then why don’t they show real testimonials by real students instead of buying them from actors?! They tell you that you can make up to $500,000 a year with dropshipping working only 20 minutes a day! As someone who tried different ways of making money online, including dropshipping with Shopify, I can tell you that you need long time, learning and working several hours per day, before you start making any profit, and then, work even more for a longer time in order to make this amount of money. There’s a learning curve in order to learn any method of making money online, and dropshipping is no different. And even after you learn it and after you become profitable with your dropshipping store, you need to spend long hours everyday researching new products continuously, running test ads for these new products, monitoring the Facebook ads, cutting the losing campaigns, optimizing and scaling up the winners, fulfilling orders, dealing with customer support and replying to the emails from buyers, dealing with refunds and returns, …etc. And even if you want to outsource the majority of the work activities, you still need to run the marketing campaigns by yourself, and these require lots of time and effort on daily basis, you can’t do them in 20 minutes! Not to forget that you still need to manage the team you hired or the freelancers you outsourced, and that also, cannot be done in 20 minutes a day! And I’m not saying that you can’t make this amount of money with dropshipping, of course you can, but it will take long hours everyday before you reach this level, IF you learn from a legit program that teaches you what you really need in order to succeed. They keep showing you screenshots of $10,000 days, or $500,000 year, but they don’t tell you that these are not all profit. These numbers you see are the sales value and not the profits! Don’t forget that you still need to pay to the original merchant the price of the product and the cost of the shipping (25-40% of the price you sell at), you need to pay for Facebook ads that are getting more expensive everyday (30-45% of the price), processing fees for the payment gateway (PayPal, Stripe, …etc. ), And some other stuff, in addition to the people you will hire in order to outsource parts of the work. You might end up with 15-30% as profit, which is still better than nothing, but they don’t mention that to you because they want to make you believe that you can make hundreds of thousands per year easily so that you buy their crappy program. They tell you that this is a secret method and that almost nobody knows about. And they tell you that only big companies can make money with it, until he developed his system! That’s not true at all! Dropshipping with Shopify is a well-known method and money normal people are already doing it. And he didn’t develop a system of any value, he just created a low quality course to teach you what you can easily learn for FREE on YouTube. 5. Who Is Tom Parker? The guy who speaks in the video claims to be the founder of eCom Profit Sniper: Tom Parker. But he doesn’t show his face, and probably no one has ever heard of him before this program. For the very basic training that you can find even better for FREE on YouTube?! And worse, you can’t make profit with this training, you need a more advanced one. Not worth the time wasted. I have nothing against upsells, but I don’t like that they don’t mention that from the beginning! They sell you on the dream of making lots of money with so little effort and with a very cheap course and they claim that there’s only one payment of $37, but after you purchase the front end program, you will get surprised that you can’t make any money with it, and that you need to purchase another recurring or one-time-fee high-ticket program! If they were doing a professional business, then they should be honest since the beginning. 8. The First Email You Receive …. Just enter your name and email address and click the yellow button in order to go to the checkout page, and then leave the checkout page without purchasing eCom Profit Sniper program. Wait few minutes and then check your email inbox, you will most likely find an email from them recommending to you buy another program that they promote as affiliates in order to make commissions from you if you purchase it. And when I clicked on the link, it took me to another product called Cash Formula that offers you another “completely done-for-you” system that makes you money without doing anything by yourself. What do you think of someone who is trying to sell you his program, then, after you enter your email and even before you purchase his program, he offers you another unrelated program??!!!! If this tells you anything, then it tells you that he knows that his program is so rubbish that you will immediately start looking for other programs after you have failed with his program. Who Is eCom Profit Sniper For? For whoever has some extra money and wants to give it to someone that will just give him a very basic training that can be easily found on YouTube, and one that doesn’t make any money. The price of eCom Profit Sniper is $37 for the access of the very basic training that won’t make you any profit, and then there are upsells that they will tell you that you will need in order to make money dropshipping. Then why do you pay the first $37 in the first place?!! Conclusion – Is eCom Profit Sniper A Scam Or Legit? But just because you will get something in return doesn’t mean that you need to purchase eCom Profit Sniper Course. As I showed you, the training of eCom Profit Sniper is very basic and doesn’t really help you make money with dropshipping, and it is the gate towards offering you other upsells and high-ticket programs although they promise you that you have only to pay a one-time-fee. Add to that the hyped-up claims and promises, FAKE TESTIMONIALS, promoting other unrelated products to you, …etc. For all of the reasons mentioned above, I don’t recommend purchasing the Com Profit Sniper System at ALL. A 100% Legitimate Alternative To eCom Profit Sniper Program? If you are already involved in the dropshipping business, and you are suffering to make any progress, and you want to learn how to do it the right way, then I recommend that you only learn from one of the best in this industry. Someone who already taught thousands of students and many of them have made great results by taking action of what he teaches. My recommended program to learn dropshipping in this case is eCom Elites by Franklin Hatchett. Frank is a genuine and a legit person and I have been following his social media accounts for a long time, and many people are giving him honest testimonials, unlike the fake ones you saw in the video of eCom Profit Sniper. And when compared to other courses, Frank’s course is really under-priced for the value and the follow-up you will receive. As I told you earlier, Dropshipping is a legitimate business model and you can really make money with it if you learn from someone legit like the one mentioned in my first alternative above. But the thing is that, with dropshipping, you need to rely on the PAID traffic using Facebook ads mainly, which are getting more expensive everyday. In order to learn how to do start making profit with this method, you need to test many products using these ads until you find a winning product that people want to buy. And that might require another investment of around $1,000-$2,000 in addition to the original cost of the training course. And after you find a winning product, even though you don’t need to touch the product by yourself, but you need to spend the time paying the merchants and asking them to fulfill the orders, reply to emails from your customers, deal with refunds and returns, …etc. Not to mention that dealing with Facebook ads is really painful and time-consuming. And if you have the additional $1,000-$2,000 (in addition to the course’s cost), and can handle the stress from the paid ads, then you can go ahead with this method. But in case that you don’t have this amount of money, or in case that you can’t handle the stress of dealing with customers, and the followup with the Facebook paid ads, then let me recommend another method for making money that is even more newbie-friendly than dropshipping. It still needs you to put the consistent effort for not a short period of time, but at least you don’t deal with customer support by yourself and you won’t need to handle the stressful Facebook ads, at least not from the beginning, as you will rely mainly on the FREE traffic from the search engines such as Google, Bing and Yahoo. This method is also a 100% Legit method, but in my opinion, it is more newbie-friendly than dropshipping, requires lower initial cost as you don’t need to pay for ads, and is associated with a lower level of risk and stress. So, if you want to learn more about what this method is and where you can learn it, then you can read my Ultimate Make Money Online Guide in order to learn about it. And in this guide, you will learn about the platform where I learned this method. This platform, will allow you to try it even for FREE before you pay any money! No Credit Card required, 100% Risk Free! In addition to that, if you join this platform I’m recommending, you can get direct coaching by ME. Contenu Review – Why I Won’t Use It!